Zion Williamson and Tacko Fall showed fans were right to hype up their matchup as Duke and UCF battled for a spot in the Sweet 16. The Blue Devils’ 6-7, 285-pound star finished with 32 points on 12-of-24 shooting, 11 rebounds and four assists in 40 minutes. The Knights’ 7-6, 310-pound giant finished with 15 points on 7-of-10 shooting, six rebounds and three blocks in 25 minutes. And while they met time and again during the game, sometimes Fall coming out on top and other times Williamson doing the same, their final meeting set up the final stretch of play that decided the game. 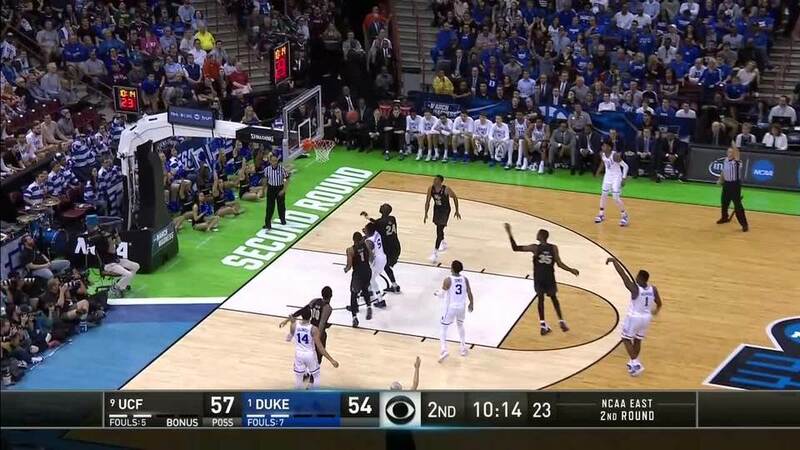 With Duke trailing UCF by three and less than 20 seconds left in the game, Williamson took the ball and drove toward the rim. Fall met him as he had many times before, but while a couple previous meetings ended in blocks, this one ended in Fall’s fifth and final foul. Williamson made the shot, too. And with 14.4 seconds left Duke had a shot to tie the game and Fall took a seat on the bench. The free throw missed, but RJ Barrett corralled the offensive rebound and hit a shot to put Duke up for good. Duke won, 77-76, after a couple last-ditch shots for the Knights missed, and earned a trip to the Sweet 16. Want to re-live some of their battles?